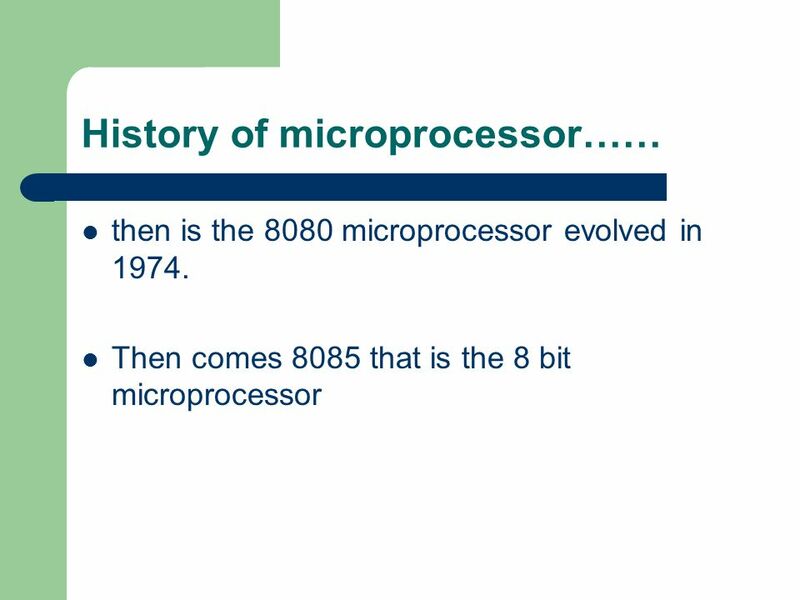 Microprocessor is a programmable device It can be instructed to perform given tasks with in its capability. 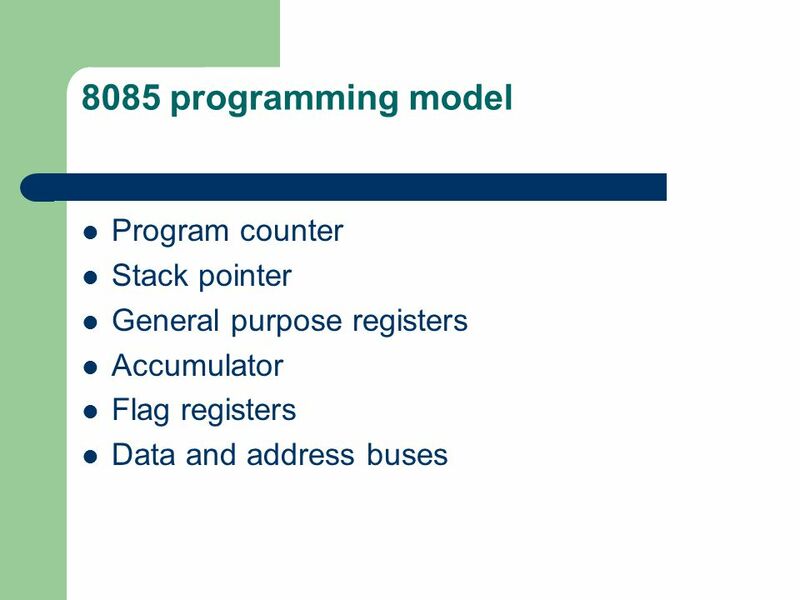 The programmer selects instruction from the list and determines the sequence of execution for a given task. 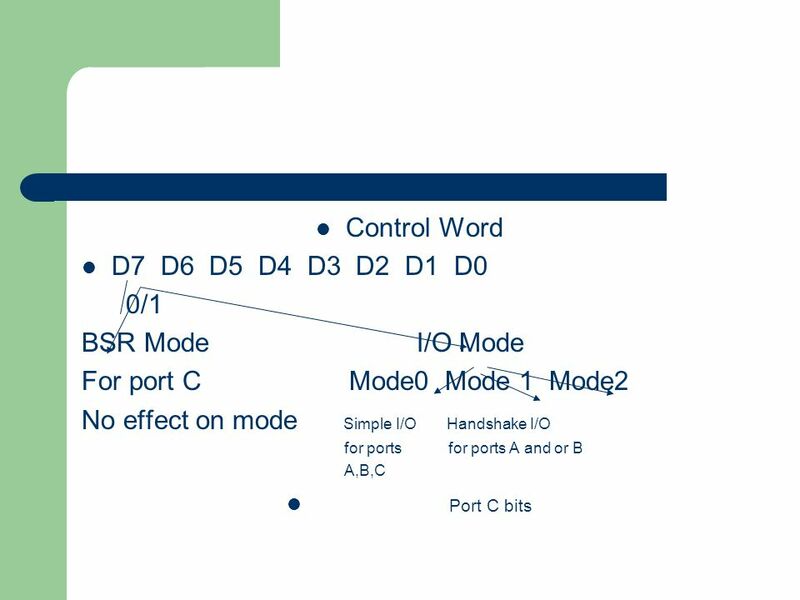 It takes input from the input device and process the input as it behaves like a CPU and gives the output. 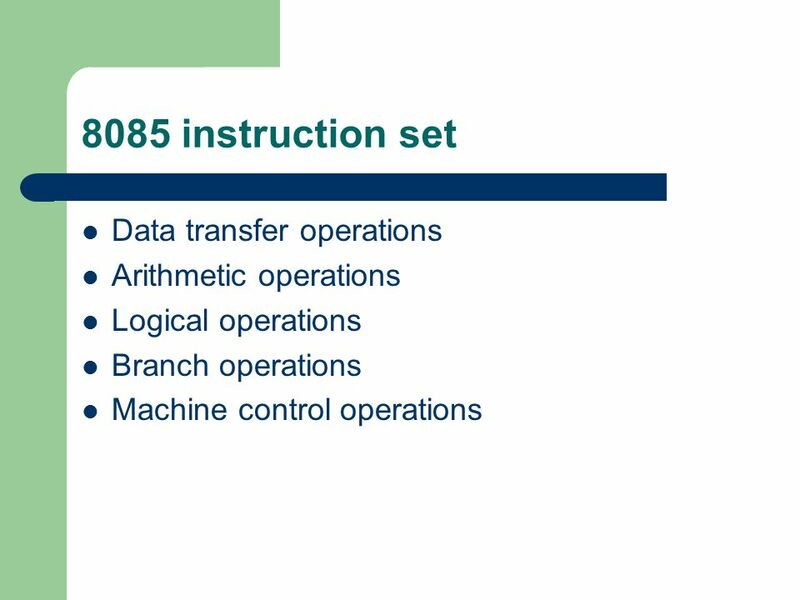 Instruction set: The set of instructions that the microprocessor can execute. 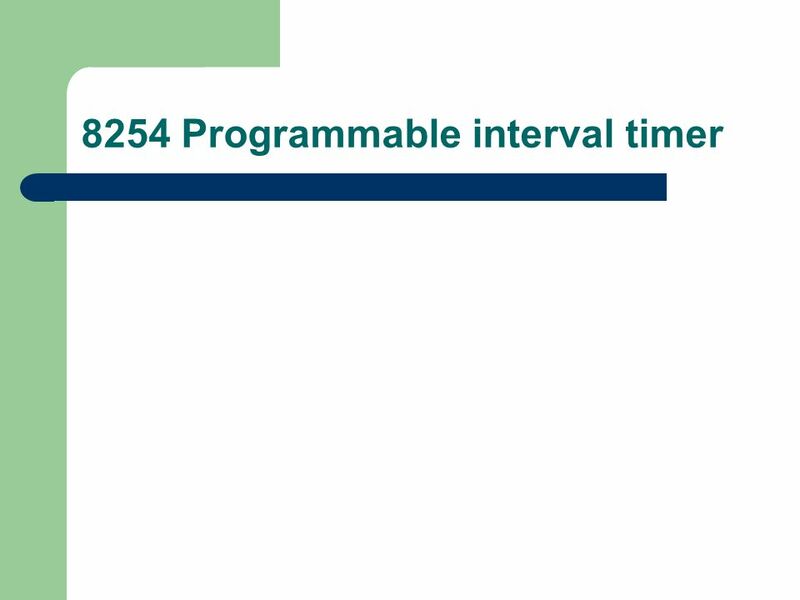 bandwidth : The number of bits processed in a single instruction. 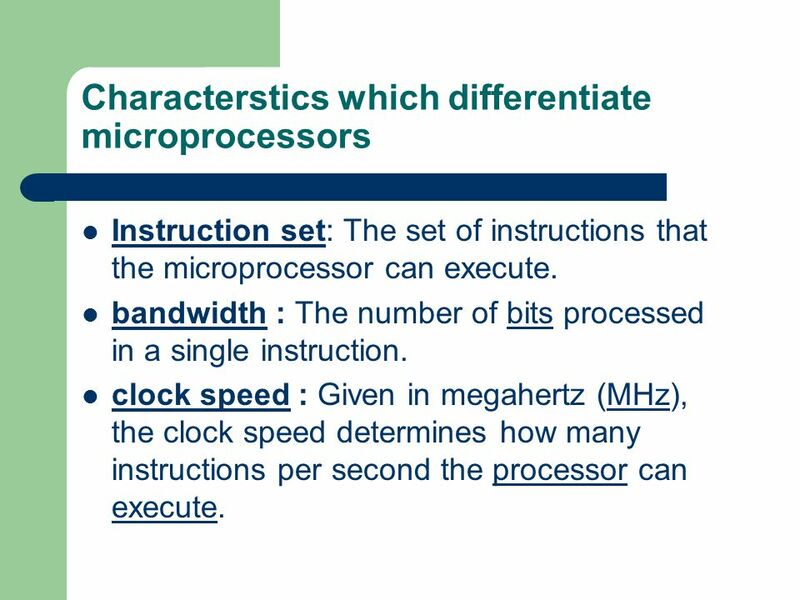 clock speed : Given in megahertz (MHz), the clock speed determines how many instructions per second the processor can execute. 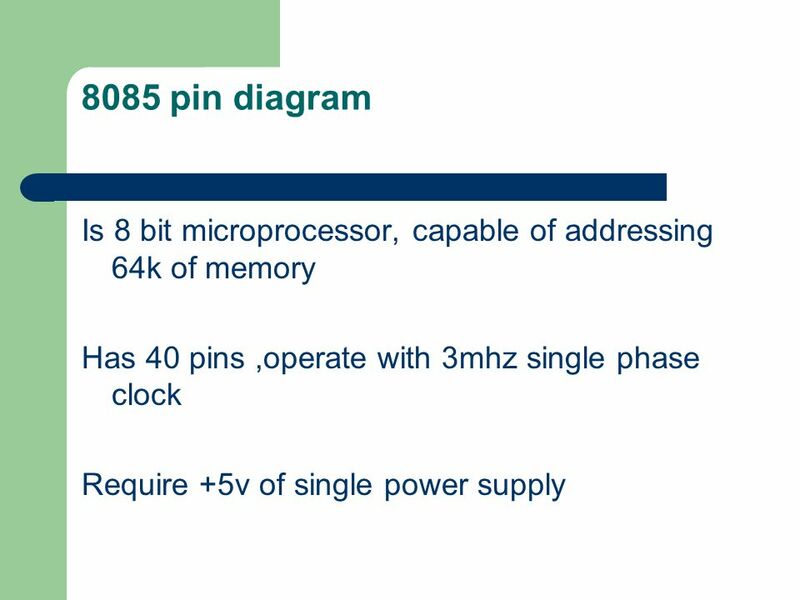 Chip containing no. 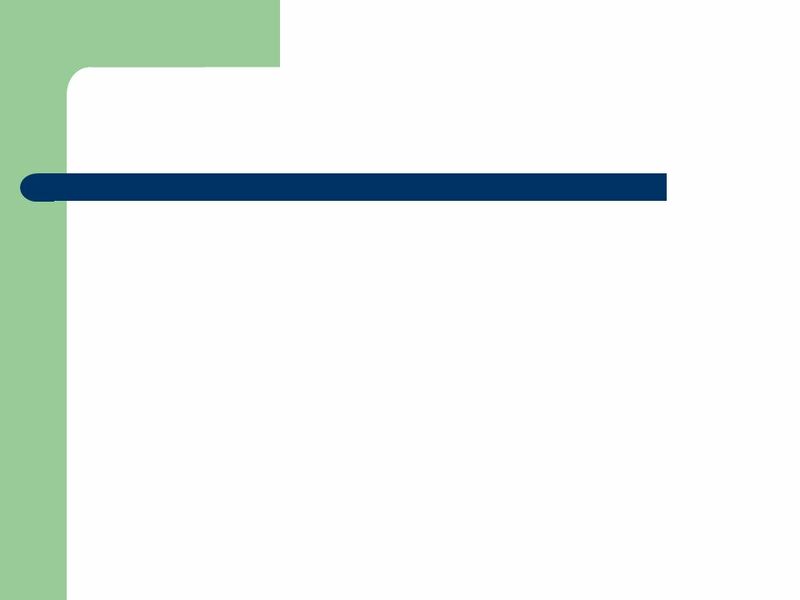 of elements for the processing purposes. 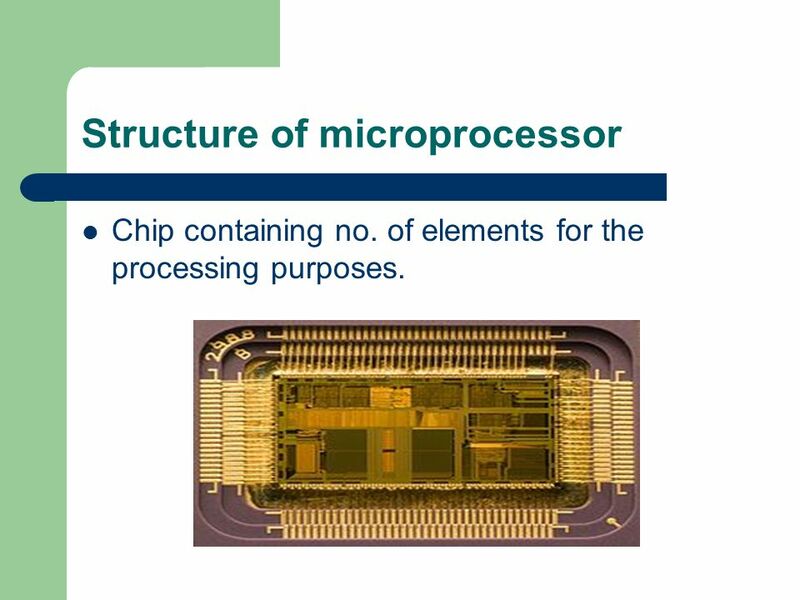 Intel's 4004 is considered the first microprocesor . 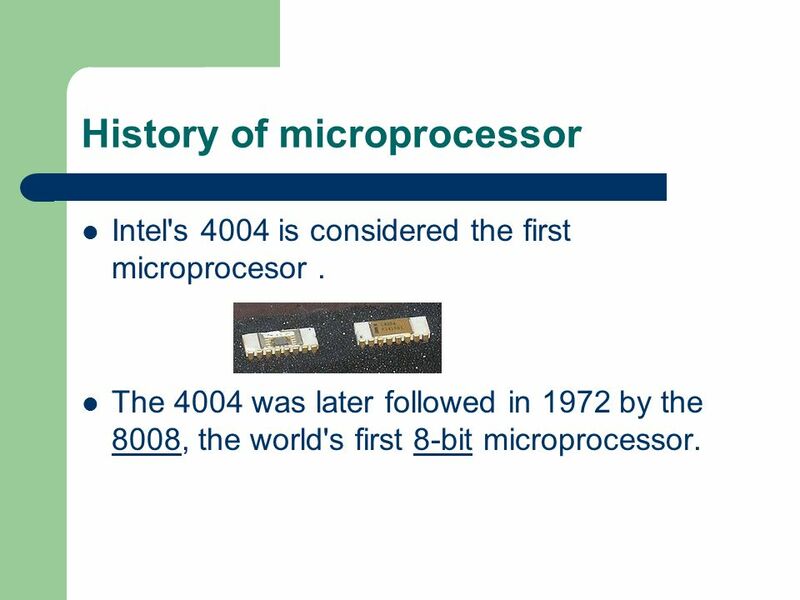 The 4004 was later followed in 1972 by the 8008, the world's first 8-bit microprocessor. 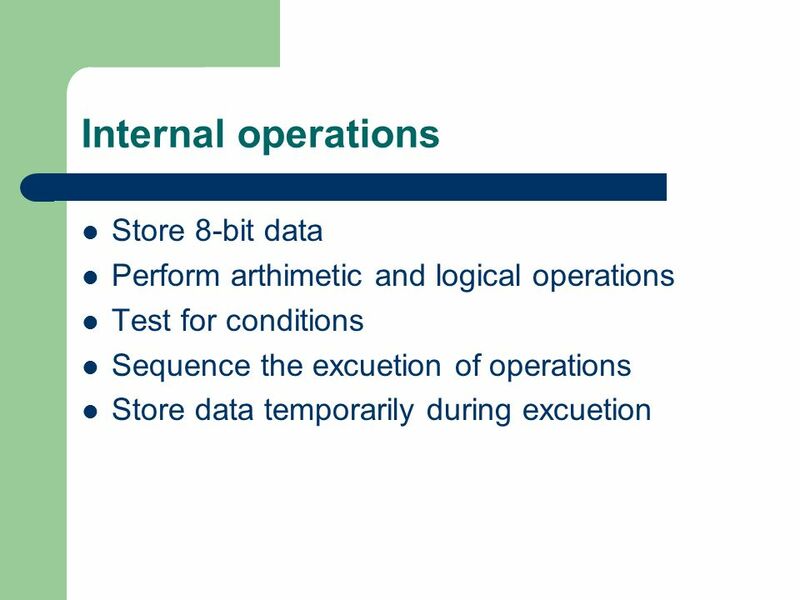 12 Continued… Often the processor is required to manage various different tasks that have to be scheduled somehow and must also deal with outside interrupt sources such as an alarm when something goes wrong. 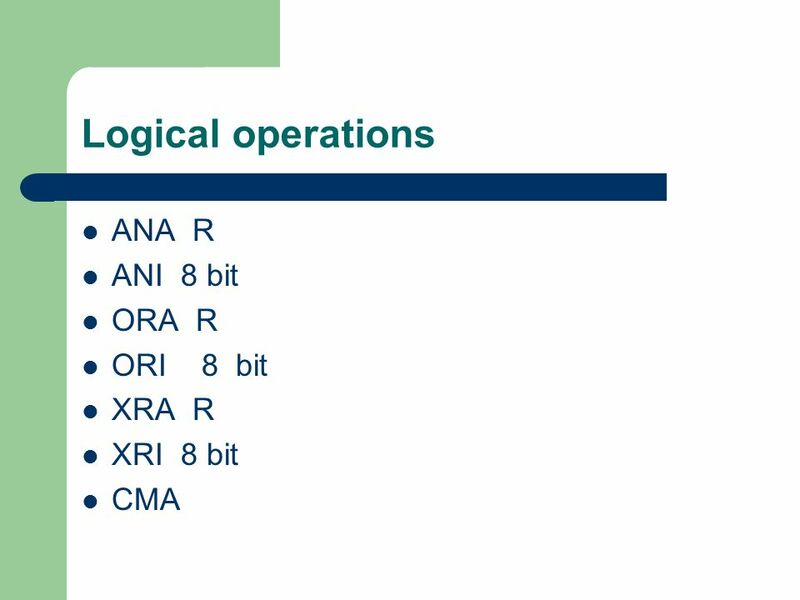 Real-time systems are those in which timeliness is as important as the correctness of the outputs, although this does NOT mean that they have to be ?fast systems?. 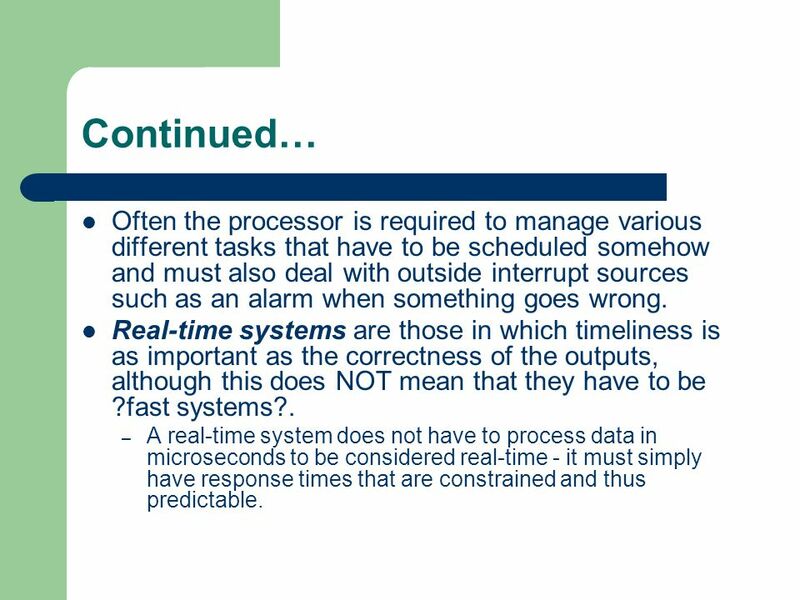 A real-time system does not have to process data in microseconds to be considered real-time - it must simply have response times that are constrained and thus predictable. 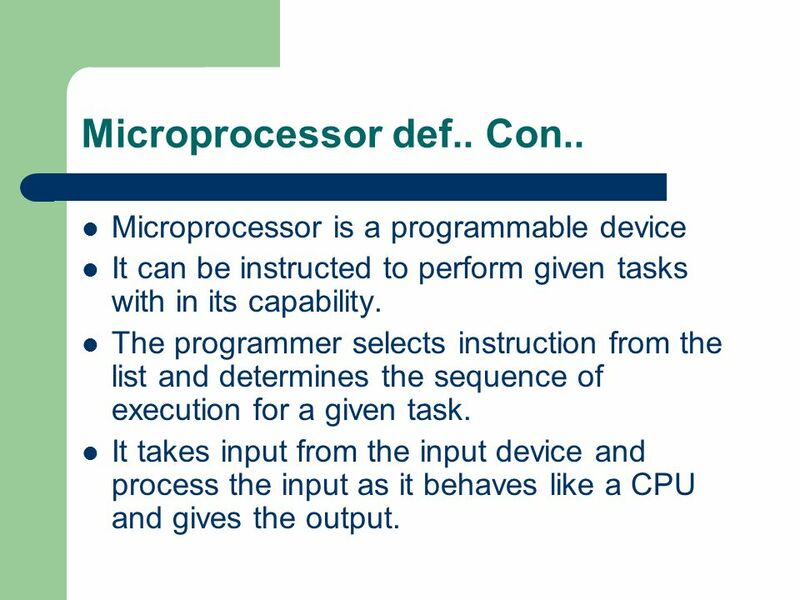 Microprocessors are used to handle a set of tasks that control one or more external events or systems. 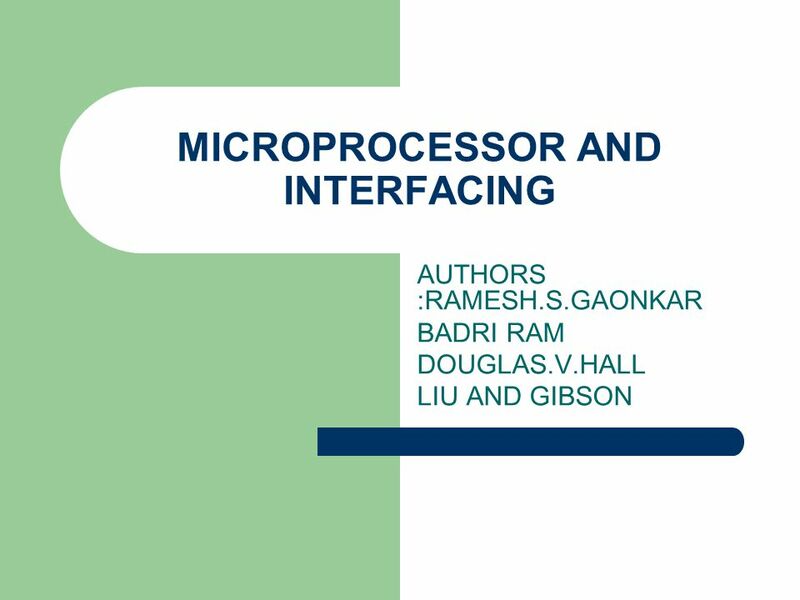 Microprocessors are typically used in either reactive or embedded systems. 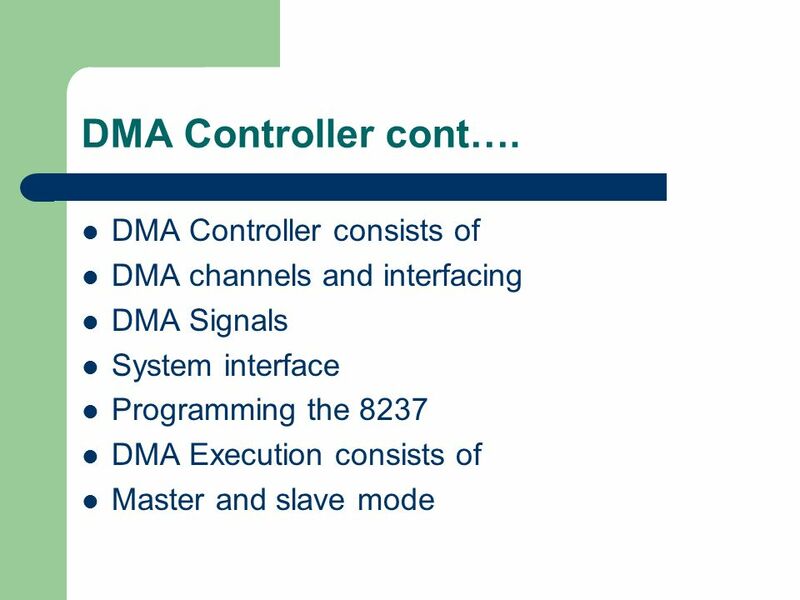 Reactive systems are those that have an ongoing interaction with their environment - for example, a fire-control system that constantly reacts to buttons pressed by a pilot. 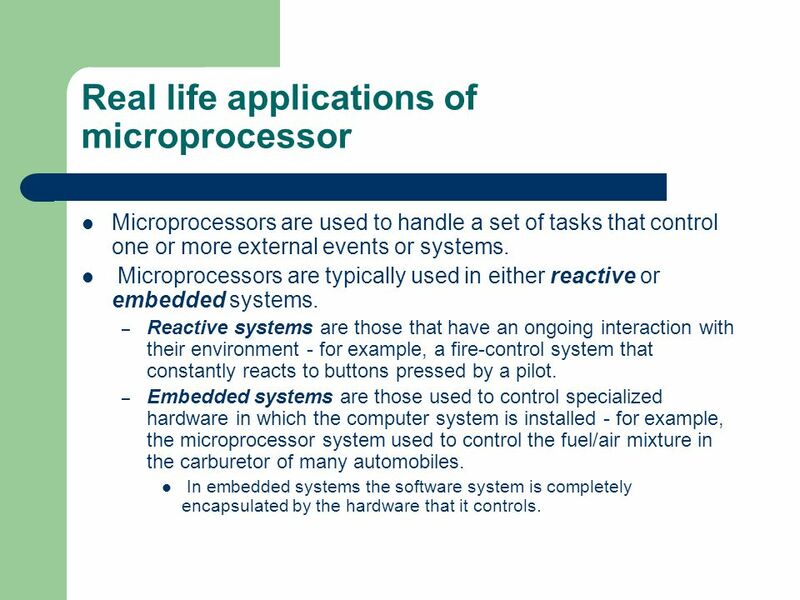 Embedded systems are those used to control specialized hardware in which the computer system is installed - for example, the microprocessor system used to control the fuel/air mixture in the carburetor of many automobiles. 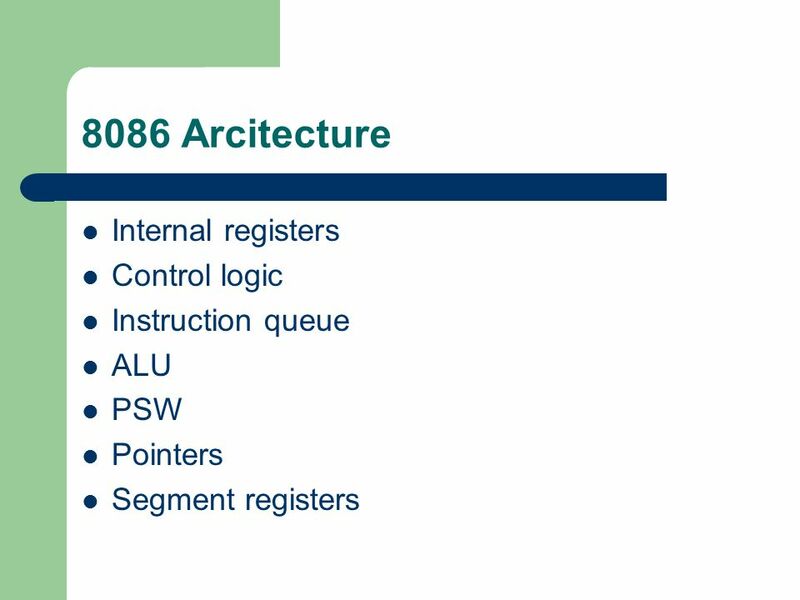 In embedded systems the software system is completely encapsulated by the hardware that it controls. 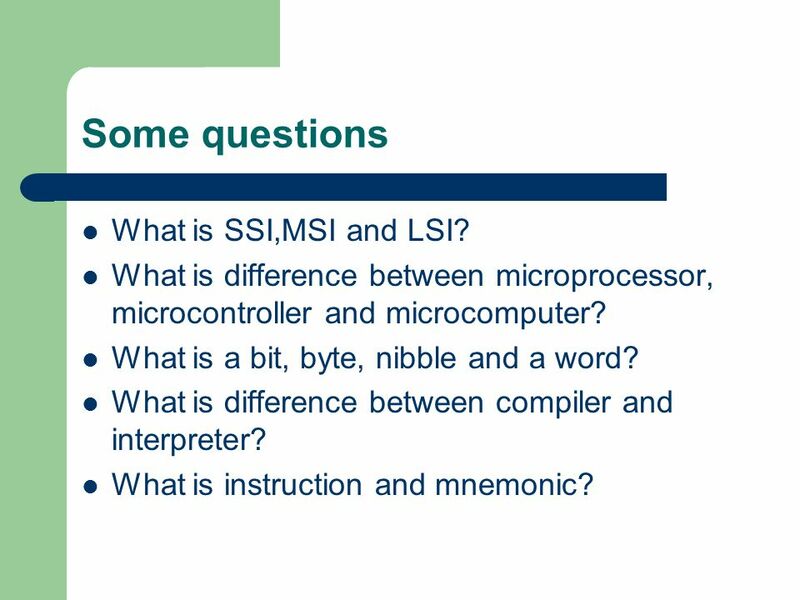 14 Some questions What is SSI,MSI and LSI? 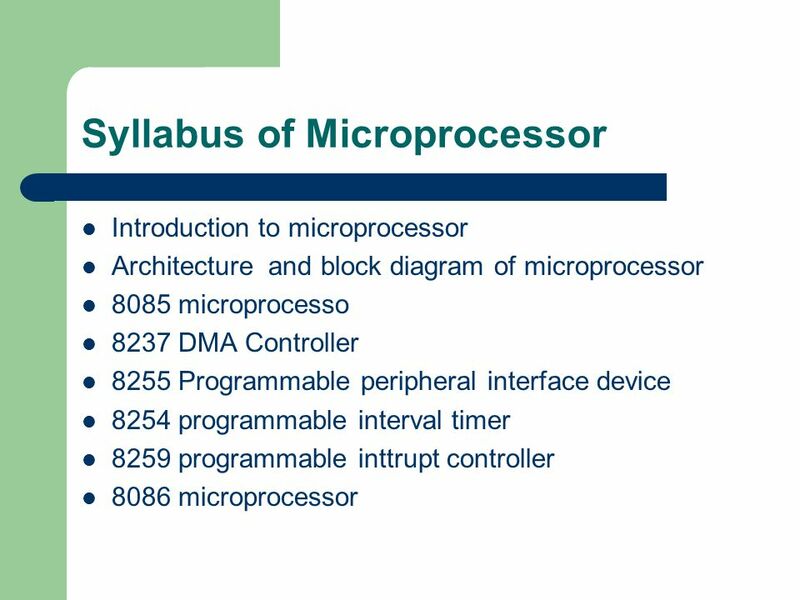 What is difference between microprocessor, microcontroller and microcomputer? What is a bit, byte, nibble and a word? 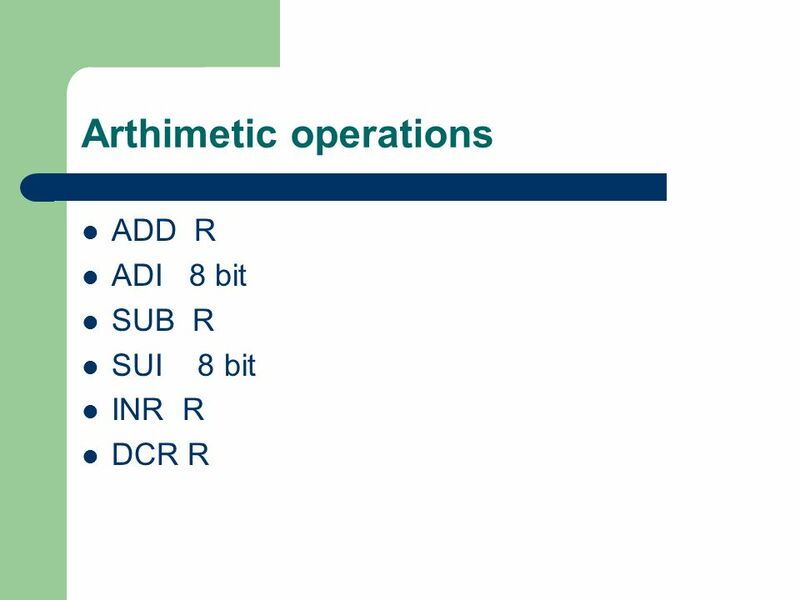 What is difference between compiler and interpreter? 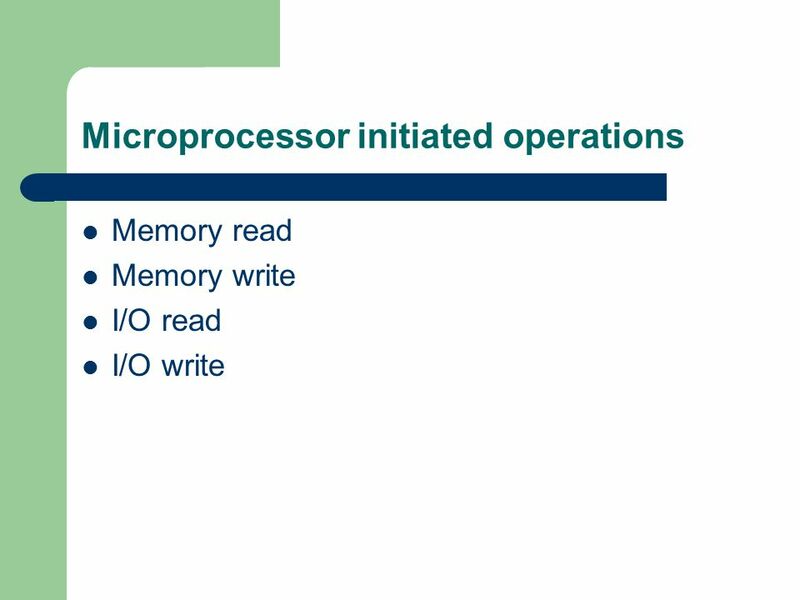 What is instruction and mnemonic? 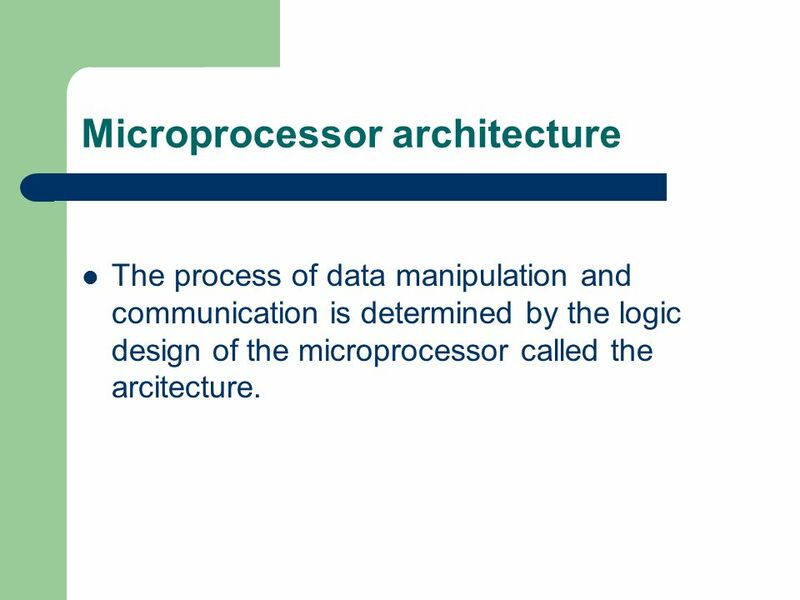 The process of data manipulation and communication is determined by the logic design of the microprocessor called the arcitecture. 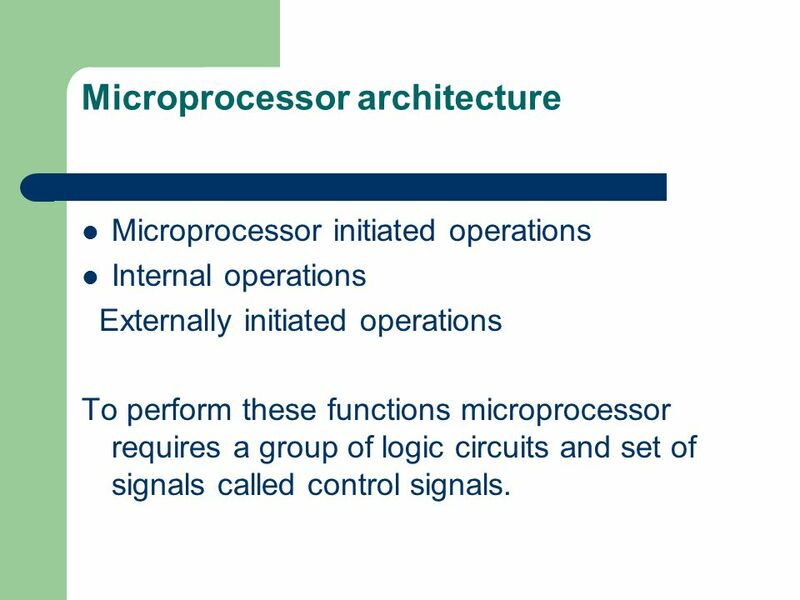 Microprocessor initiated operations Internal operations Externally initiated operations To perform these functions microprocessor requires a group of logic circuits and set of signals called control signals. 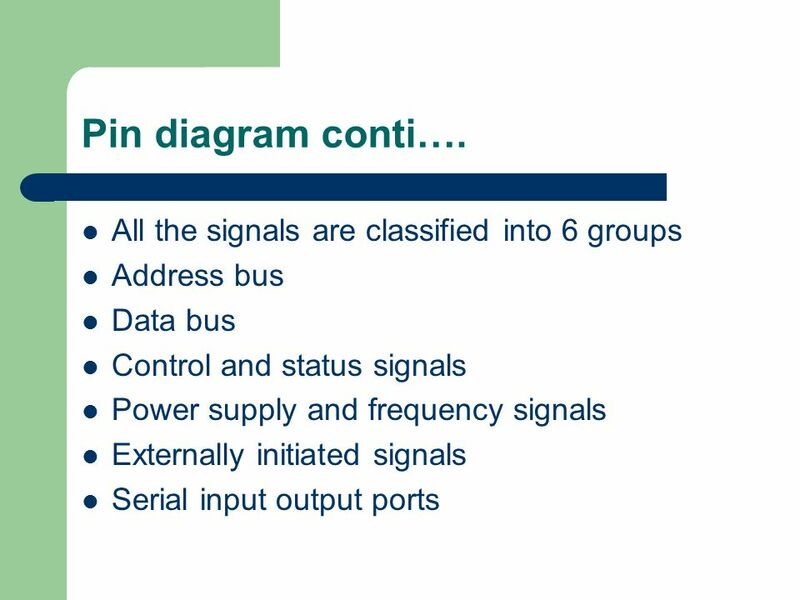 34 Interrupts An interrupt is considered to be an emergency signal that may be serviced. 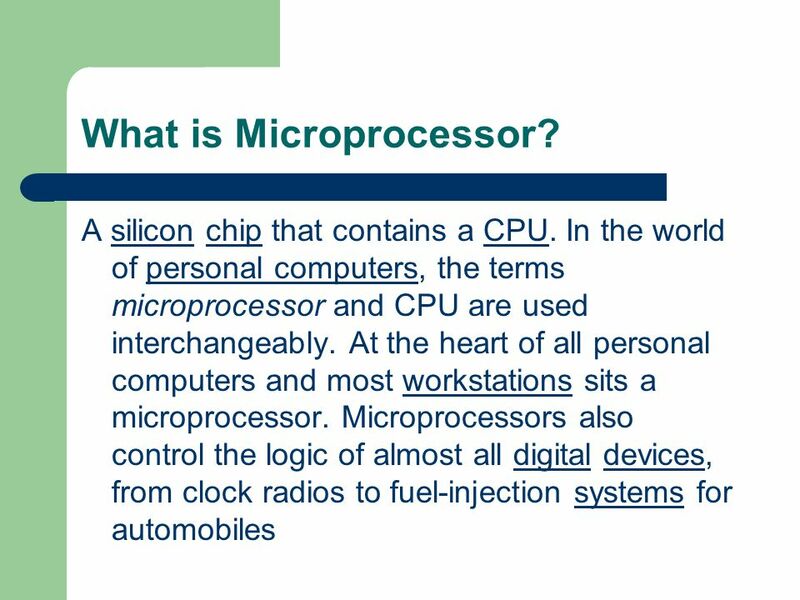 The Microprocessor may respond to it as soon as possible. 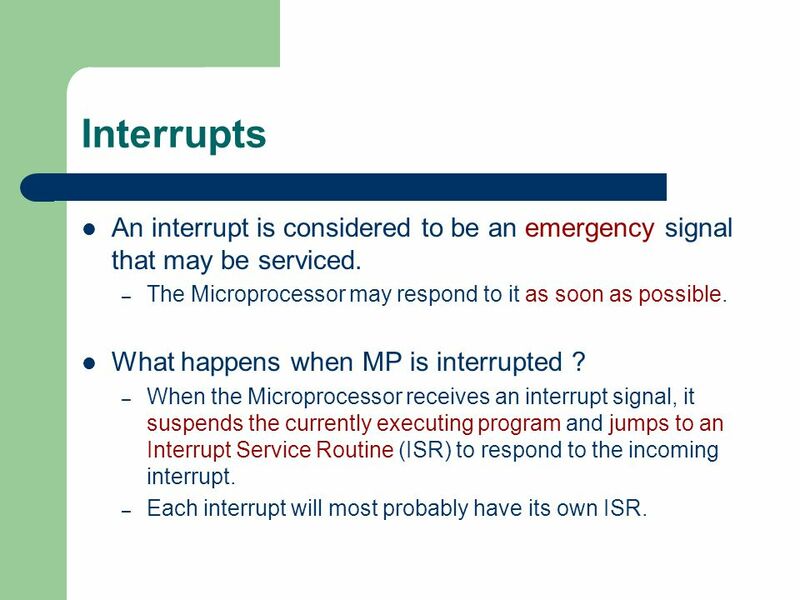 What happens when MP is interrupted ? 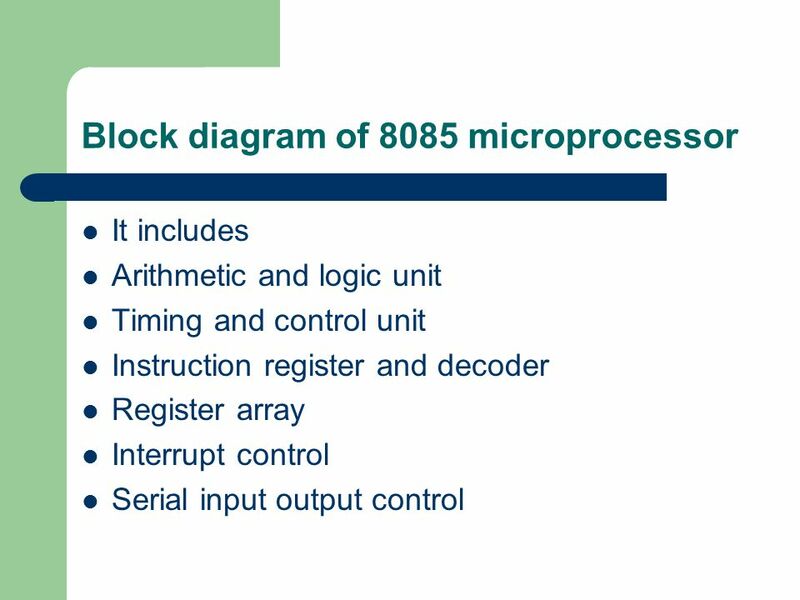 When the Microprocessor receives an interrupt signal, it suspends the currently executing program and jumps to an Interrupt Service Routine (ISR) to respond to the incoming interrupt. 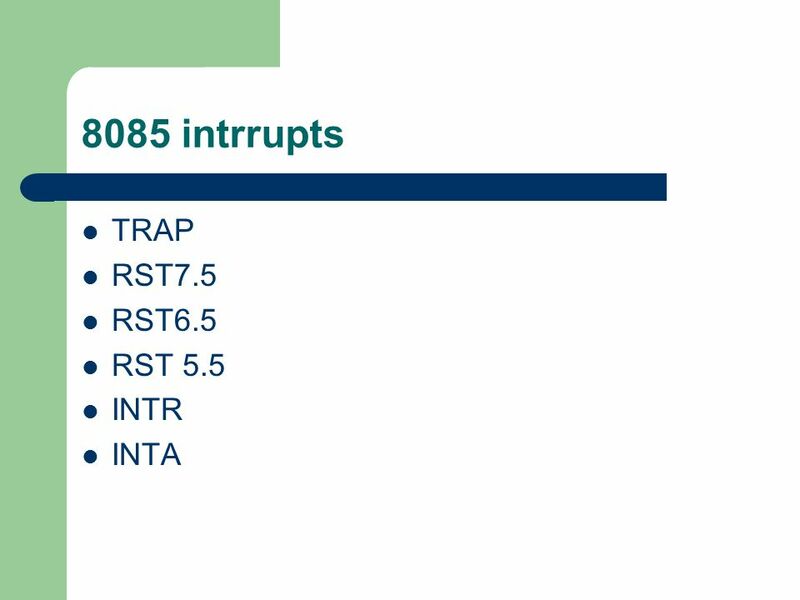 Each interrupt will most probably have its own ISR. 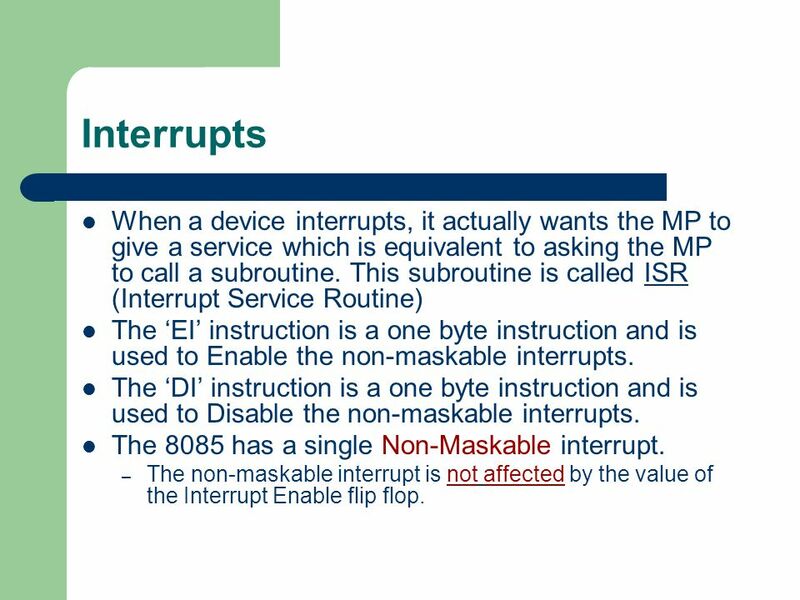 35 Interrupts When a device interrupts, it actually wants the MP to give a service which is equivalent to asking the MP to call a subroutine. 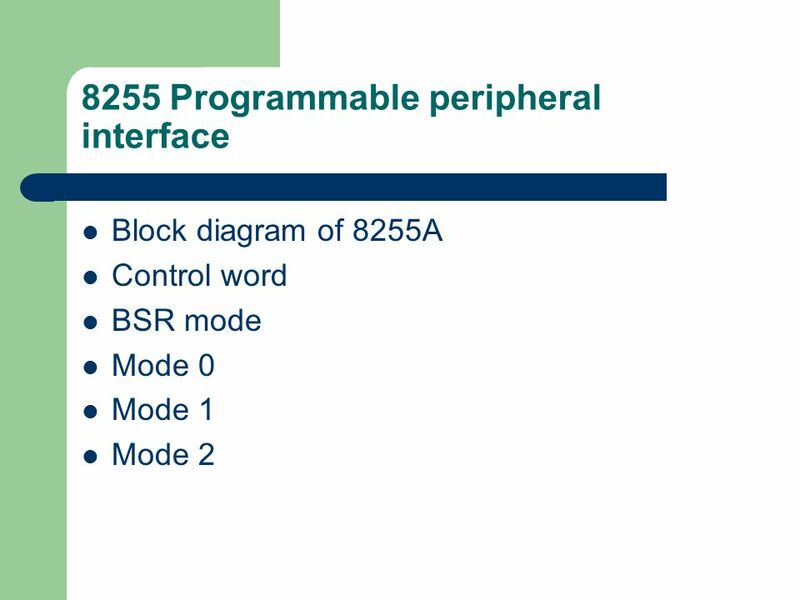 This subroutine is called ISR (Interrupt Service Routine) The ‘EI’ instruction is a one byte instruction and is used to Enable the non-maskable interrupts. 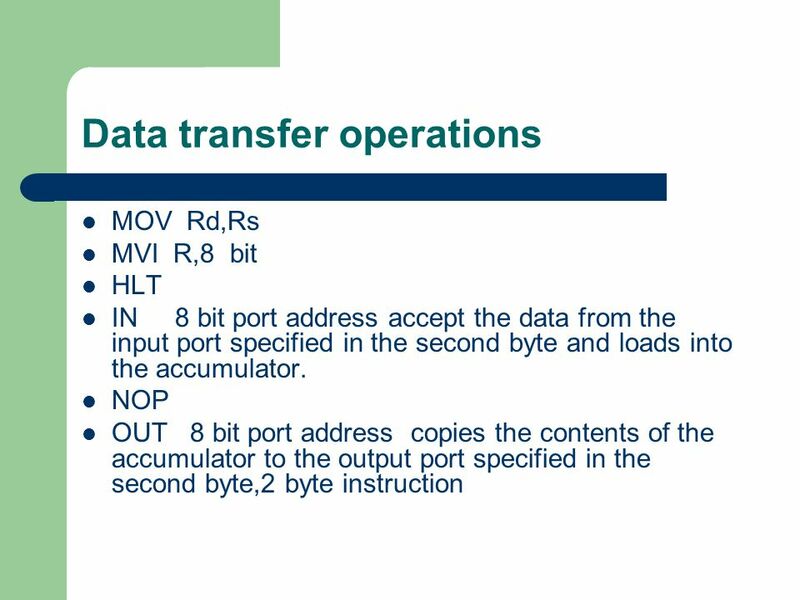 The ‘DI’ instruction is a one byte instruction and is used to Disable the non-maskable interrupts. 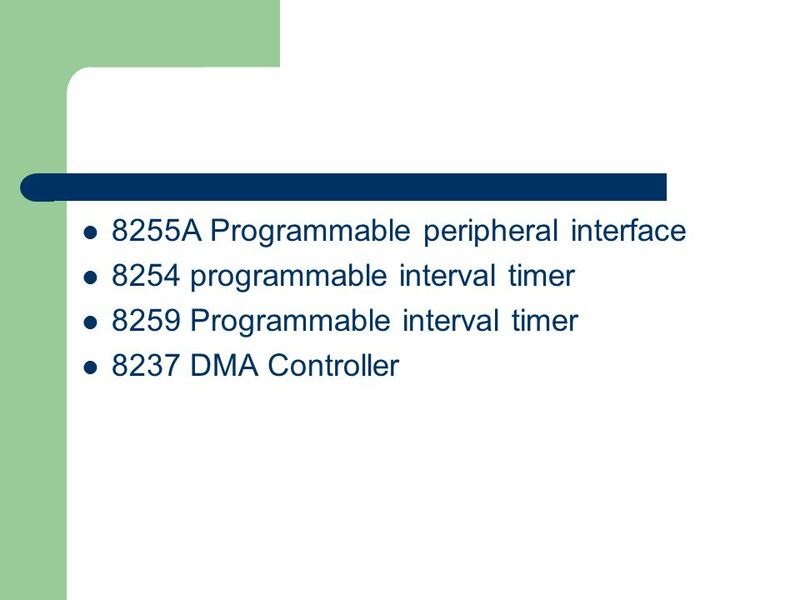 The 8085 has a single Non-Maskable interrupt. 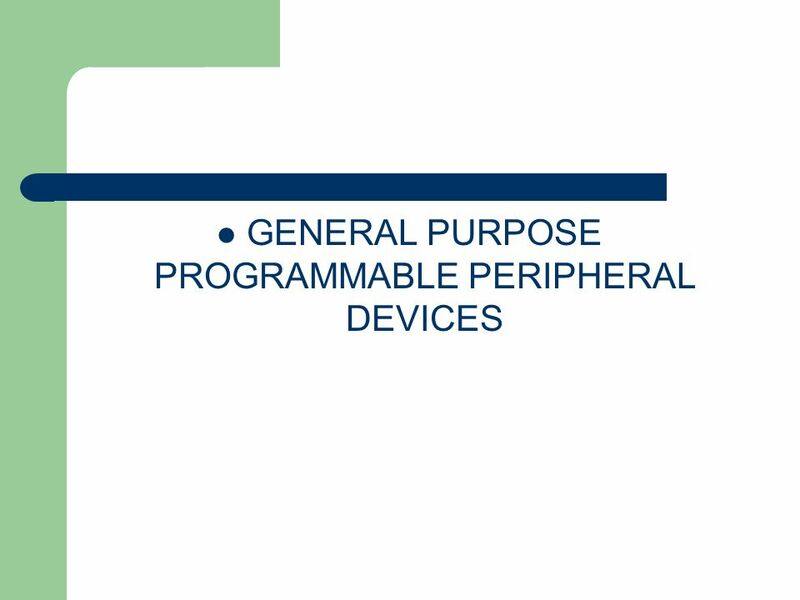 The non-maskable interrupt is not affected by the value of the Interrupt Enable flip flop. 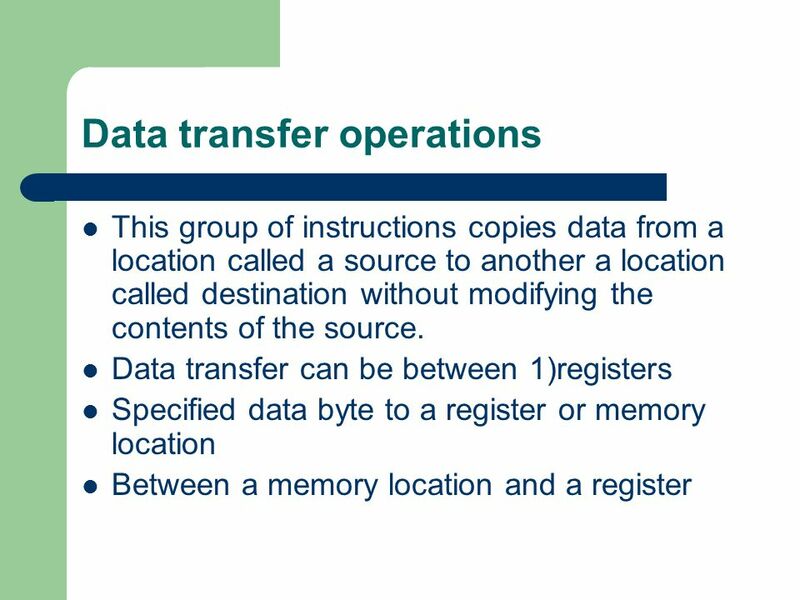 An interrupt vector is a pointer to where the ISR is stored in memory. 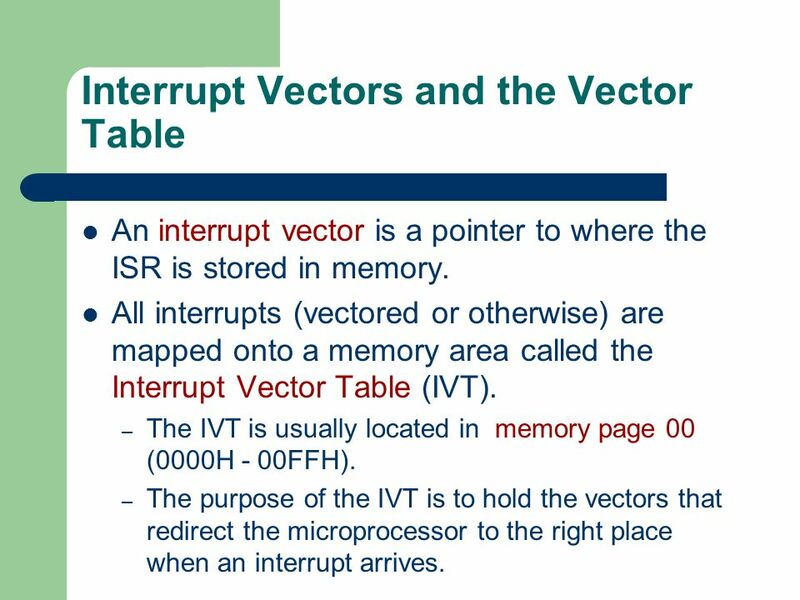 All interrupts (vectored or otherwise) are mapped onto a memory area called the Interrupt Vector Table (IVT). 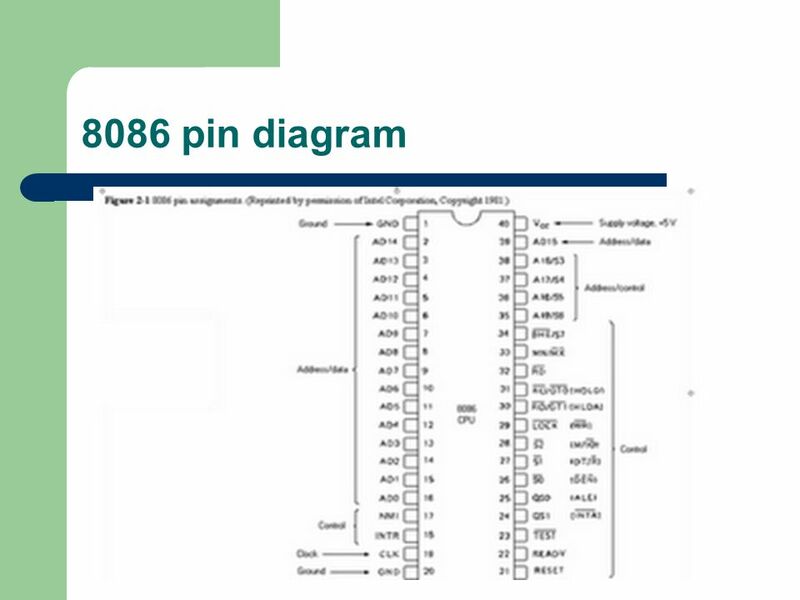 The IVT is usually located in memory page 00 (0000H - 00FFH). 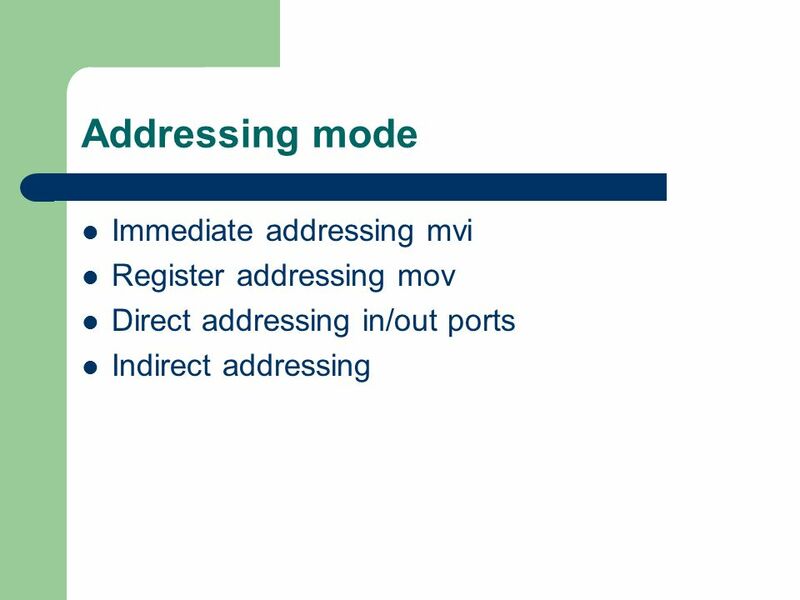 The purpose of the IVT is to hold the vectors that redirect the microprocessor to the right place when an interrupt arrives. 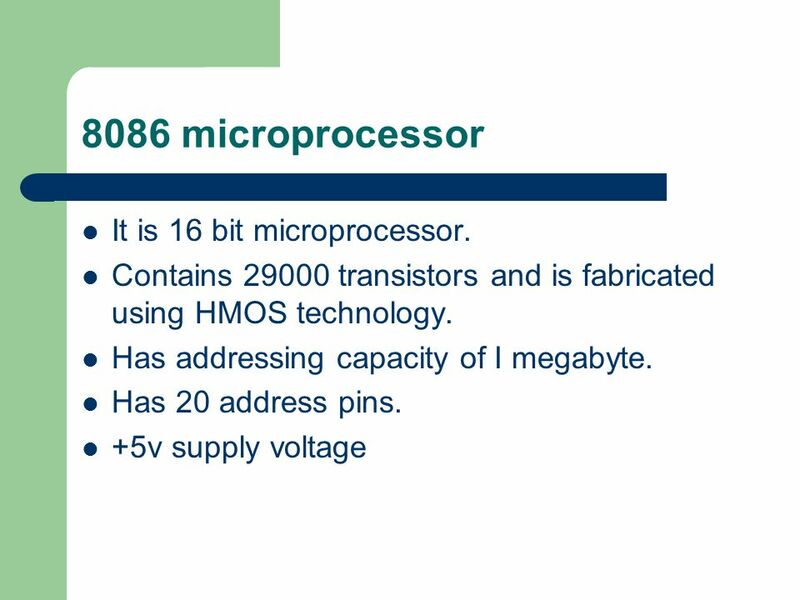 47 8086 microprocessor It is 16 bit microprocessor. 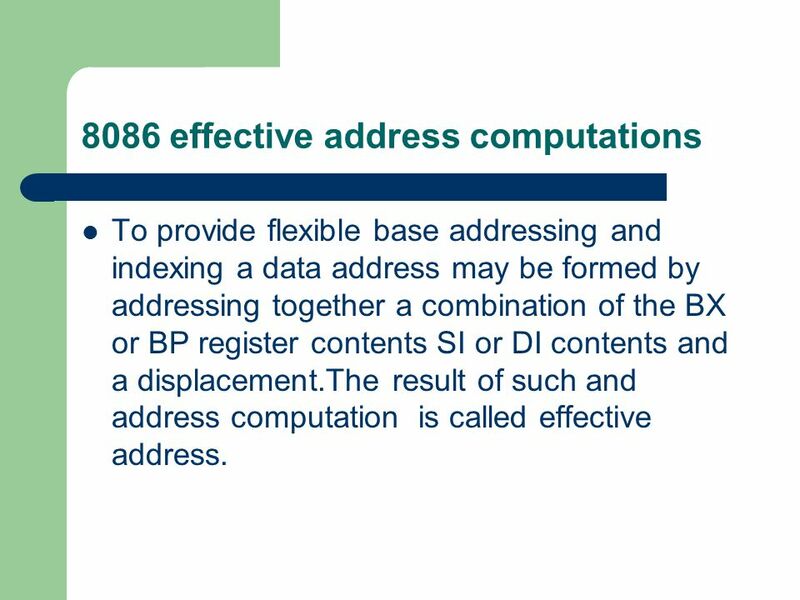 To provide flexible base addressing and indexing a data address may be formed by addressing together a combination of the BX or BP register contents SI or DI contents and a displacement.The result of such and address computation is called effective address. 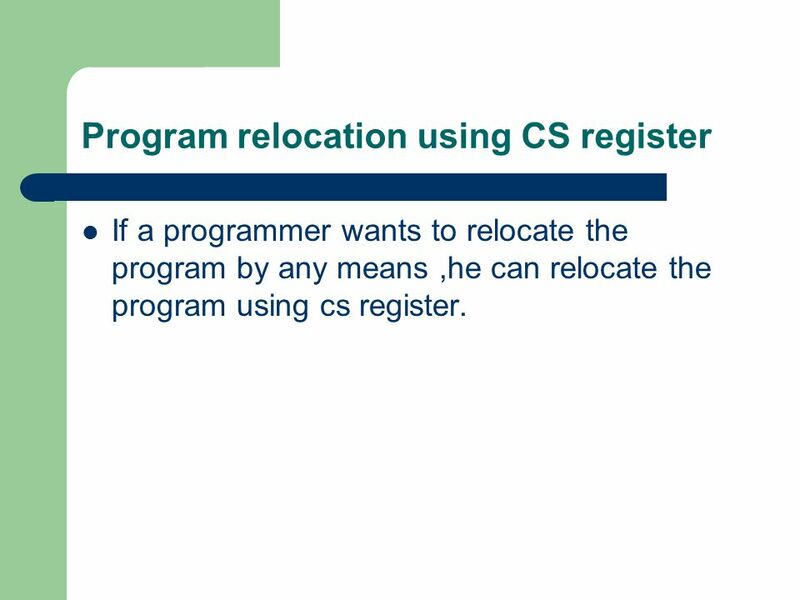 If a programmer wants to relocate the program by any means ,he can relocate the program using cs register. 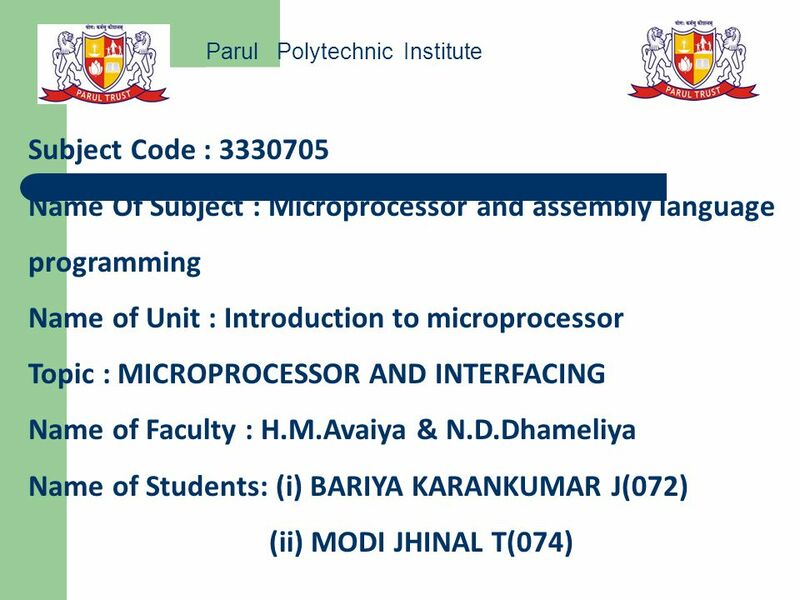 Download ppt "Parul Polytechnic Institute"
Accessing I/O Devices Processor Memory BUS I/O Device 1 I/O Device 2. 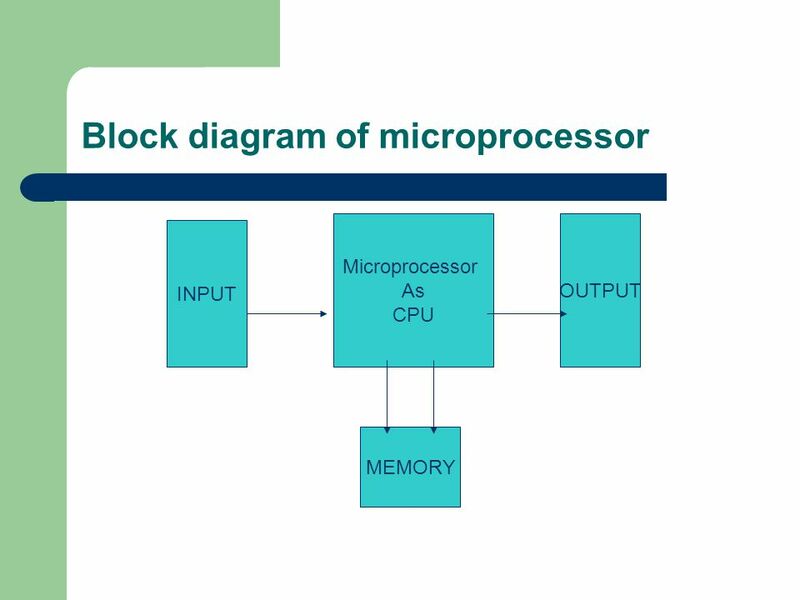 MICROPROCESSORS TWO TYPES OF MODELS ARE USED :  PROGRAMMER’S MODEL :- THIS MODEL SHOWS FEATURES, SUCH AS INTERNAL REGISTERS, ADDRESS,DATA & CONTROL BUSES. 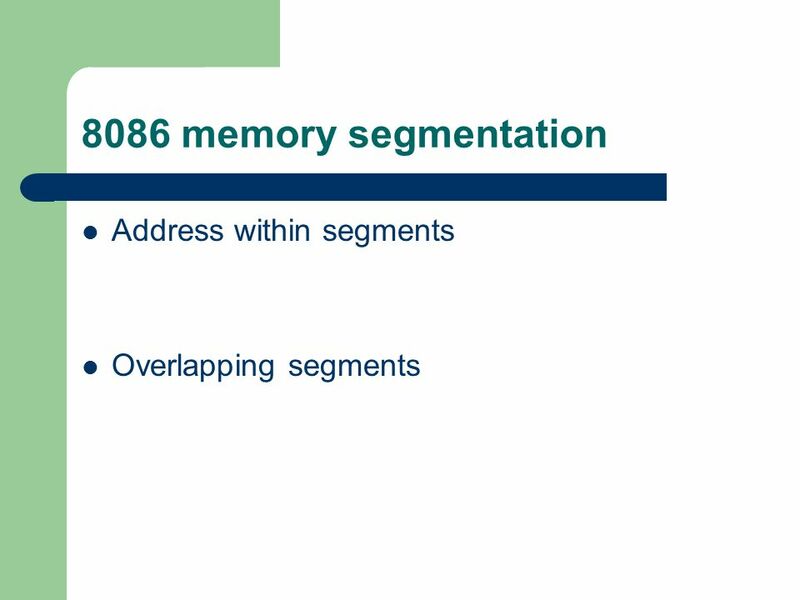 8085 Interrupts LAKSHMI.B.E.1. 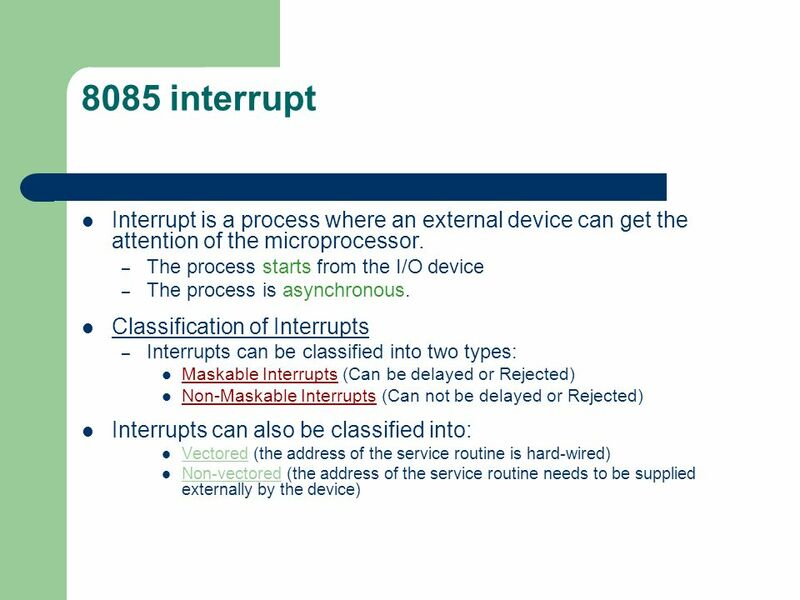 Interrupts  Interrupt is a process where an external device can get the attention of the microprocessor. ◦ The process. 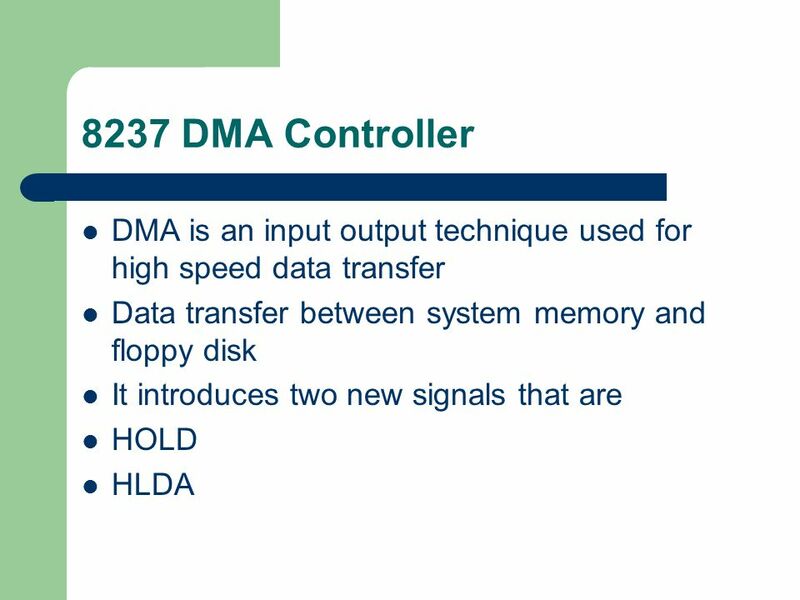 EEE226 MICROPROCESSORBY DR. ZAINI ABDUL HALIM School of Electrical & Electronic Engineering USM. 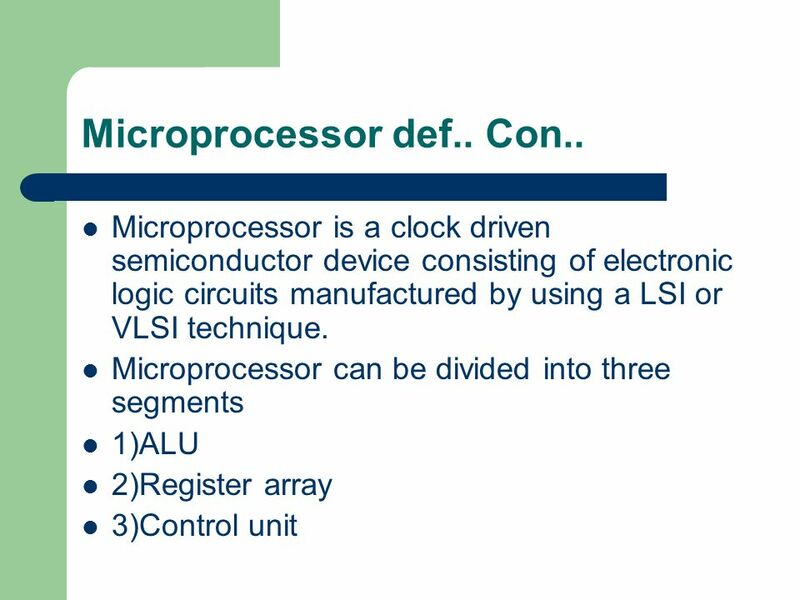 Microprocessor. 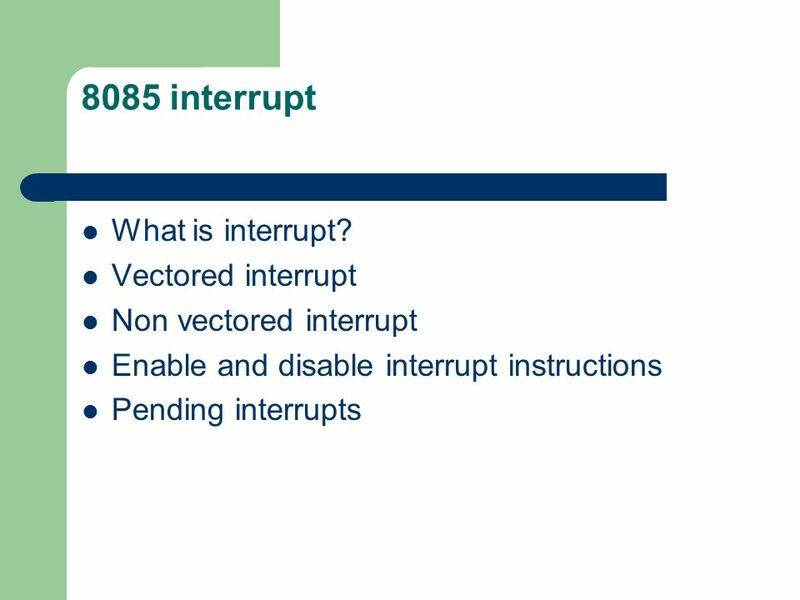 Interrupts The processor has 5 interrupts. 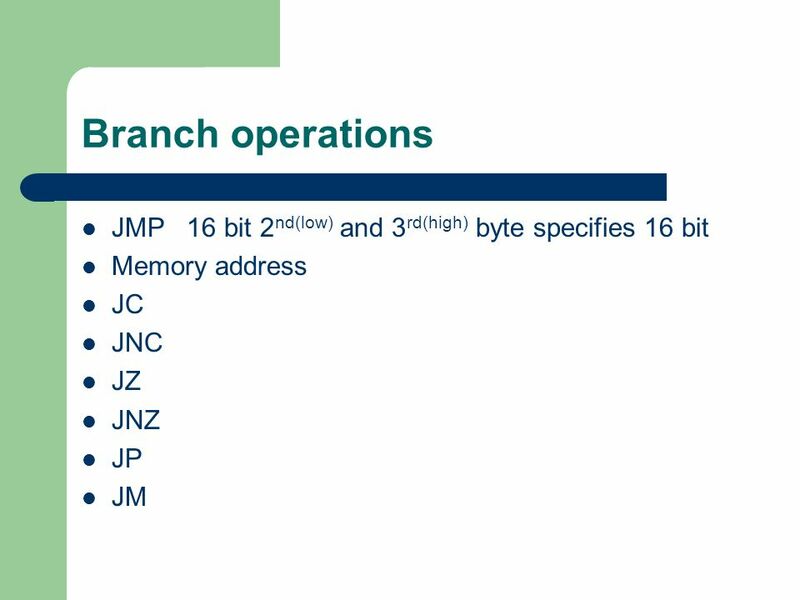 CALL instruction (3 byte instruction). 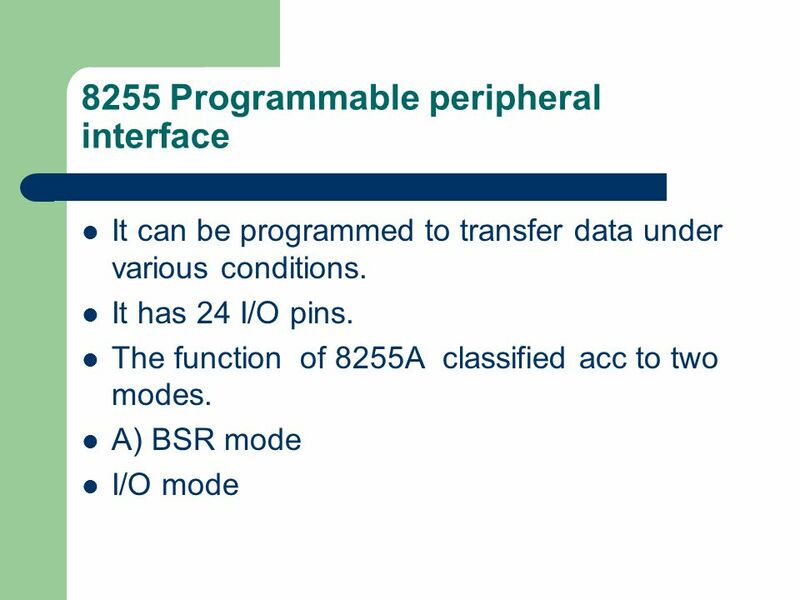 The processor calls the subroutine, address of which.